Augmented reality – what can it do for your business? This week, I headed down to Hunts Media in Kidlington, Oxfordshire for the grand unveiling of their new augmented reality (AUR) technology, Skim. Skim is designed to work in conjunction with print media – brochures, banners or posters. By ‘skimming’ print media with a smartphone or tablet with a bespoke app powered by Skim, users can enjoy extra rich content. AUR apps powered by Skim will hold their content in the programme, which users download to their device. The benefits of Skim (soon to be available to download in Android and iOS in mid-March) outweigh those of other augmented reality apps, such as Blippar, which rely on an internet connection to buffer content which often results in a slow, shaky delivery. But what can augmented reality bring to business? So far the examples we’ve seen of AUR in action have been costly and sometimes frivolous trials – such as Pepsi’s World Cup campaign. Consumers could use the Blippar app to unlock behind the scenes video content of the Brazil World Cup when they scanned a Pepsi can and download the special World Cup ‘Heroes’ single. It was technically impressive, but not exactly life-changing. Red Nose Day’s current AUR experience linked to special badges is connected with an important message; comic relief favourites, such as Harry Hill, encourage wearers to ‘make your face funny for money’. And as the Hunts team demonstrated, the reliability of the app working is 50:50 – it relies on internet connection and being able to read the curved badge – a definite AU trigger no-no, there’s simply not enough contrast and points for the app to scan and lock on to. 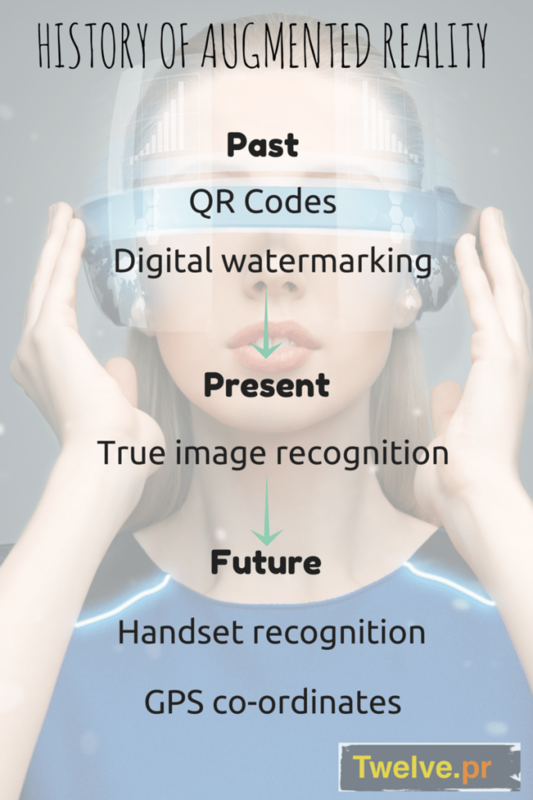 Is the future print and augmented reality combined? What AUR can provide is that trigger to get people to your website and to your product or service. Combined as part of your marketing mix and aligned with your business goals, it can be used to increase sales and develop user engagement with a brand or company. The Institute of Direct Marketing released research last year that showed that forty per cent of consumers will investigate a company or brand further after seeing print media they related to. Imagine if that print media were to come to life providing further interesting and helpful content instantly, we’re only going to increase the number of people seeking out brands. As a fan of Oxford’s Natural History Museum, I’m looking forward to their new app (powered by Skim). Their objective is to increase footfall to the Museum and their AUR app, when downloaded, provides helpful content before a visit. Yet to encourage people to make a trip to the Museum, the app will release additional content explaining exhibits when visitors cross the building’s threshold. Finally an AUR app which has the business objectives at the heart of its creation. https://www.twelvepr.co.uk/wp-content/uploads/2015/02/Screen-Shot-2015-02-20-at-11.26.08.png 580 580 Jess https://www.twelvepr.co.uk/wp-content/uploads/2017/05/logo-300x88.png Jess2015-02-20 12:31:132015-02-20 12:31:13Augmented reality – what can it do for your business? For some campaigns, an effective internal communication campaign can be more important that the external one. What factors should you take into account when developing a strategy? Here’s a checklist of factors to take into account. 2. Make a time timetable and stick to it. Nothing is more demotivating than putting things back. Everyone understands that other things have to become a priority, but nevertheless it still saps morale a little bit when an event or agreed activity doesn’t take place. Routine postponements are corrosive e.g. delayed appraisals or meetings. 3. Don’t over promise. Don’t instigate something you can’t deliver on. Find out if you can deliver by checking on all the people involved in each stage ie. due diligence/ site recce / time and motion study. E.g. could you make a meeting every Friday or is that a bad time because there’s a weekly report to submit and Thursday would be better? Could you collect all your green waste in that bin or is it too far to walk and would slow down the production line? 4. Make your communication as visual as possible and use a variety of communication methods to communicate the same point. Not everyone takes in information from written communication – a lot of people don’t actually – so if possible use a photo or graphic to communicate a message. Do not rely on just saying the same thing in slightly different ways (e.g. several emails). Try a picture, or make video of the MD talking about the plan, or publish a video once a month. 5. For big change try to organise an event which demonstrates or encapsulates that change in a physical way. Kinaesthetic learning is a great way to really make people feel the change – engage. E.g. if you’re setting new targets, have a sports day and include shooting at targets. If you have to reorganise the office, have a game of musical chairs. It’s cheesy but memorable. 7. Check language barriers. In factories and manufacturing plants English may not be the mother tongue of many staff. Having a translator – and this might be another employee – could be important especially if communicating safety issues such as new working practices. 8. Watch out for cultural differences. Again might be factories or places in ethnic areas but watch out for events at special times e.g. Ramadan when Muslims are very tired during the day. 9. Set clear targets and explain them. They might be crazy or really hard to achieve and a little bit depressing, but at least try to explain the rationale and bring people along with you. E.g. we need to achieve zero food waste to landfill as food rotting in landfill creates methane which is a green house gas twenty times more powerful than CO2. 10. Feedback information regularly. Have a central notice board, or a regular email bulletin, or staff newsletter (e.g. Mail Chimp you can then see who has clicked through etc) and tell people what has happened. If nothing has happened tell them that! 11. Share success E.g. If you want academic staff to come forward with more ideas for PR, circulate the coverage when it is achieved with a note from the VC . 12. Offer rewards and deliver on them scrupulously. E.g. if you promise to achieve zero waste to landfill, and you will give all staff a days outing if the site achieves that target, then you must deliver your promise!